مطالعه حاضر با رویکردی جامعه‌شناختی درصدد بررسی ابعاد هویت دانشجویان است. 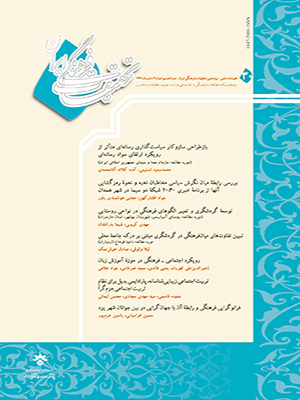 به منظور بررسی ابعاد هویت دانشجویان با توجه به دیدگاه نظریه‌پردازان ایرانی، حوزه هویت عرصه مواجهه سنت و مدرنیته به عنوان یکی از مهم‌ترین پدیده‌های اثرگذار بر هویت ایرانی مدنظر قرار گرفت. بر این اساس سعی شد ابعاد هویت دانشجویان با توجه به مؤلفه‌های سنتی و مدرن بررسی شود. فرض اصلی این پژوهش پیوندی بودن هویت دانشجویان به معنای ترکیبی از مؤلفه‌های هویتی سنتی و مدرن است. هر بُعد هویت (سنتی و مدرن) در وجه فرهنگی، اجتماعی و سیاسی بررسی شده و برای هر یک از آنها شاخص‌هایی در نظر گرفته شده است. روش این مطالعه، پیمایش و گردآوری اطلاعات مبتنی بر پرسشنامه بود. جامعه آماری دانشجویان دانشگاه‌های تهران و جمعیت نمونه از 6 دانشگاه تهران، شهید بهشتی، علامه طباطبایی، دانشگاه صنعتی شریف، دانشگاه الزهرا و دانشگاه جامع علمی ـ کاربردی انتخاب شدند. یافته‌های تحقیق نشان داد مؤلفه‌های مدرن هویت در بخش اجتماعی و فرهنگی نقش برجسته‌تری نسبت به مؤلفه‌های سنتی دارند. اما در بخش هویت سیاسی این مؤلفه‌های سنتی، یعنی گرایش به آمیختگی دین و سیاست و گرایش به اقتدارگرایی ملی و سیاسی است که در مقابل گرایش به وجود جامعه مدنی نقش برجسته‌تری در هویت دانشجویان دارد. بر اساس نتایج تحقیق، هویت دانشجویان نه یک سازه تک‌بعدی (سنتی یا مدرن) بلکه سازه‌ای پیوندی متشکل از مؤلفه‌هایی از هر دو بُعد سنتی و مدرن است. Ahmadiân, R. (1385 [2006 A.D]) “Tarâhi-ye Model-e Sâxtâr-e Hoviyatyâbi dar Javânân bâ Takiid bar Moalefe-h-hâ-ye Ŝenâxti” (Persian Translation of Model Designing of Youth Identification Structure with an Emphasis on Cognitive Factors), Majale-h Andiŝe-hâ-ye Novin-e Tarbiyati, Vol. (56):-. Berger, P. (1381 [2002 A.D]) Zehn-e Bixânemân: Nosâzi va Agâhi (Persian Translation of The Homeless Mind: Modernization and Consciousness), Translated by Mohammad Sâvoji, Tehran: Naŝr-e Ney. Boroujerdi, M. (1377 [1998 A.D]) Roŝanfekrân-e Irani va Qarb (Persian Translation of Iranian Intellectuals and the West), Translated by Jamŝid Ŝirâzi, Tehran: Farzân. Borzoii, M. (1386 [2007 A.D]) “Ŝenâxt-e Hoviyat-e Dâneŝ Amozân bar Asâs-e Jensiyat va Reŝte-h Tahsili-ye Anân dar Dâneŝ Amozân-e Madares-e Maqta-e Motevasete-h Ŝahr-e Semnân” (Persian Translation of Recognition Student's Identity Based on Their Gender and Discipline: a Case Study of Secondary School Students in Semnân), Majale-h Andiŝe-hâ-ye Novin-e Tarbiyati, Vol. – (50): -. Cramer, P. (2000) “Development on Identity: Gender Makes a Difference”, Journal of Research in Personality, Vol.29 (34): 341-361. Cross, S. & Medson, L. (1997) “Models of the Self-Construal and Gender”, Psychological Bulletin, Vol. 122(1): 5-37. Enâyat, H. (1351 [1972 A.D]) “Siyâsat-e Irânŝenâsi” (Persian Translation of The Policy of Iranian Study), Majale-h Negin, Vol.- (88): 5-8. Giddens, A. (1382 [2003 A.D]) Modernity va Hoviyat-e Ŝaxsi (Persian Translation of Modernity and Self-Identity), Translated by Nâsser Movafaqiân, Tehran: Naŝr-e Ney. Hall, S. (1383 [2004 A.D]) “Hoviyathâ-ye Qadim va Jadid, Qaomiyathâ-ye Qadim va Jadid” (Persian Translation of Old and New Identities, Old and New Ethnics), Translated by Ŝahriyâr Vaqfipoor, Faslnâme-h Organon, Vol. - (24): 319-352. ______ (1990) “Cultural Identity and Diaspora” in Rutherford, J. (ed)، Identity, London: Lawrence and Whishart. Hall, S. (1987) Minimal Selves in Identity: The Real Me, ICA Document 6, London: Institute for Contemporary Arts. Hardt, M. & Negri, A. (1386 [2007 A.D]) Anboh-e Xalq (Persian Translation of Multitude: War and Democracy in the Age of Empire), Translated by Reza Najaf Zâde-h, Tehran: Naŝr-e Ney. Jenkins, R. (1381 [2002 A.D]) Hoviyat-e Ejtemâi (Persian Translation of Social Identity), Translated by Toraj Yârahmadi, Tehran: Ŝirâze-h.
Kroger, J. (Eds) (1997) Identity in Adolescence, The Balance between Self and Other, London and New York: Routledge. Lawer, S. (2008) Identity: Sociological Perspectives, Cambridge: Polity Press. Meskoob, S. (1379 [2000 A.D]) Hoviyat-e Irâni va Zabân-e Farsi (Persian Translation of Iranian Identity and Farsi Language), Tehran: Farzân. Nasr, S. (1361 [1982 A.D]) Xâterât-e Seyyed Nasr (Persian Translation Seyyed Nasr`s Memories), Interviews with Hassan Ziaei, October 1982 and January 1983, Massachusetts. Râhnamâ, A., Abdolmâleki, S. (1387 [2008 A.D]) “Darâmadi bar Mabâni-ye Nazari-ye Hoviyat: Barrasi-ye Naqŝ-e Dâneŝgâh va Jensiyat dar Hoviyatyâbi” (Persian Translation of An Introduction to Theoretical Principles of Identity: The Role of University and Gender in Identification), Naŝriye-h Taxasosi-ye Ŝorâ-ye Ali-ye Enqelâb-e Farhangi, Vol. (21-22): 35-46. Ŝâdemân, F. (1382 [2003 A.D]) Tasxir-e Tamadon-e Farangi (Persian Translation of the Capture of Western Civilization), Tehran: Gâm-e No. Ŝariati, A. (1364 [1985 A.D]) “Bazgaŝt be-h Xiŝtan” (Persian Transaltion of Return to the Self), Majmoe-h Asâr, Tehran: Daftar-e Tadvin va Tanzim-e Asâr-e Ali Ŝariati. Ŝâyegân, D. (1356 [1977 A.D]) Asia dar Barâbar-e Qarb (Persian Translation of Asia and West), Tehran: Bâq-e Ayene-h.
Sorouŝ, A. (1375 [1996 A.D]) “Zehniyat-e Moŝavaŝ, Hoviyat-e Moŝavaŝ” (Persian Translation of the Disturbed Mentality, Disturbed Identity), Majale-h Kiân, Vol. (30) 30-35. Sydmn, S. (1386 [2007 A.D]) Keŝmakeŝ-e Arâ dar Jâmeeŝenâsi (Persian Translation of The Conflicts of Ideas in Sociology), Translated by H. Jalili, Tehran: Naŝr-e Ney. Tâjik, M. (1384 [2005 A.D]) Revayat-e Qeyriyat va Hoviyat dar Miyân-e Iranian (Persian Translation of Otherness and Identity Narrative Among Iranians), Tehran: Farhang-e Goftemân.